In October 2014 or thereabouts it became known that the SSL protocol (specifically SSL v3) was broken and decryption of the encrypted data was possible. This blog post sets out the steps to protect your Exchange Server organization regardless of whether you have one server or many, or whether or not you use a load balancer or not. As load balancers can terminate the SSL session and recreate it, it might be that changes are needed on your load balancer or maybe directly on the servers that run the CAS role. This blog post will cover both options and looks at the settings for a Kemp load balancer and a JetNexus load balancer. Of course being an Exchange Server MVP, I tend to blog about Exchange related stuff, but actually this is valid for any server that you publish to the internet and probably valid of any internal server that you encrypt traffic to via the SSL suite of protocols. Microsoft outline the below configuration at https://technet.microsoft.com/en-us/library/security/3009008.aspx. The steps in this blog will look at turning off the SSL protocol in Windows Server and turning on the TLS protocol (which does the same thing as SSL and is interchangeable for SSL, but more secure at the time of writing – Jan 2015). Some clients do not support TLS (such as Internet Explorer on Windows XP Service Pack 2 or earlier, so securing your servers as you need to do may stop some home users connecting to your Exchange Servers, but as XP SP2 should not be in use in any business now, these changes should not affect desktops. You could always use a different browser on XP as that might mitigate this issue, but using XP is a security risk in an of itself anyway! To disable clients from connecting to SSL v3 sites requires a client or GPO setting and this can be found via your favourite search engine. Note that the registry settings and updates for the load balancers in this blog post will restrict client access to your servers if your client cannot negotiate a mutual cipher and secure channel protocol. Therefore care and testing are strongly advised. Authentication section: record the signature algorithm. For the signature algorithm its possible the certificate authority signature will be marked “SHA1withRSA WEAK SIGNATURE”. This certificate, if rekeyed and issued again by your certificate authority might be replaced with a SHA-2 certificate. The Google Chrome browser from September 2014 will report sites secured with this SHA-1 certificate as not fully trustworthy based on the expiry date of the certificate. If your certificate expires after Jan 1st 2017 then get it rekeyed as soon as possible. As 2015 goes on, this date will move closer in time. From early 2015 this cut off date becomes June 1st 2016 and so on. Details on the dates for this impact are in http://googleonlinesecurity.blogspot.co.uk/2014/09/gradually-sunsetting-sha-1.html. You can also use https://shaaaaaaaaaaaaa.com/ to test your certificate if the site is public facing, and this website gives details on who is now issuing SHA-2 keyed certificates. You can examine your external servers for SHA-1 certificates and the impact in Chrome (and later IE and Firefox) at https://www.digicert.com/sha1-sunset/. To do the same internally, use the DigiCert Certificate Inspector at https://www.digicert.com/cert-inspector.htm. Authentication section: record the path values. Ensure that each certificate is either in the trust store or sent by the server and not an extra download. Handshake simulation section: Here it will list browsers and other devices (mobile phones) and what their default cipher is. If you do not support the cipher they support then you cannot communicate. Note that you typically support more than one cipher and the client will often support more than one cipher to, so though it is shown here as a mismatch this does not mean that it will not work and if this client is used by your users then click the link for the client and ensure that the server offers at least one of the the ciphers required by the client – unless all the ciphers are insecure in which case do not use that client! Once you have a document on your current configuration, and a list of the clients you need to support and the ciphers they need you to support, you can go about removing SSL v3 and insecure ciphers. To disable SSL v3 on a Windows Server (2008 or later) you need to set the Enabled registry value at “HKEY_LOCAL_MACHINE\SYSTEM\CurrentControlSet\Control\SecurityProviders\Schannel\Protocols\SSL 3.0\Server” to 0. If this value does not exist, the create a DWORD value called “Enabled” and leave it at 0. You then need to reboot the server. If you are using Windows 2008 R2 or earlier you should enable TLS v1.1 and v1.2 at the same time. Those versions of Windows Server support TLS v1.1 and v1.2 but it is not enabled (only TLS v1.0 is enabled). To enable TLS v1.1 and v1.2 use set the Enabled value at “HKEY_LOCAL_MACHINE\SYSTEM\CurrentControlSet\Control\SecurityProviders\Schannel\Protocols\TLS 1.1\Server” to 1. Change the path to “HKEY_LOCAL_MACHINE\SYSTEM\CurrentControlSet\Control\SecurityProviders\Schannel\Protocols\TLS 1.2\Server” and the same setting to support TLS v1.2. If these keys do not exist, create them. It is also documented that the “DisabledByDefault” key is required, but I have seen this noted as being the same as the “Enabled” key – just the opposite value. Therefore as I have not actually checked, I set both Enabled to 1 and DisabledByDefault to 0. To do both the disabling of SSL v2 and v3 (v2 can be enabled on older versions of Windows and should be disabled as well) I place the following in a .reg file and double click it on each server, followed by a reboot for it to take effect. This .reg file contents also disables the RC4 ciphers. These ciphers have been considered insecure for a few years and when I configure my servers not to support SSL v3 I also disable the RC4 ciphers as well. Once you have applied both of the above sets of registry keys you can reboot the server at your convenience. 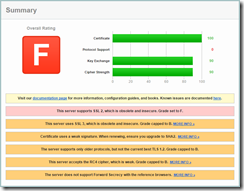 Note that the regkeys may set values that are already set, for example TLS v1.1 and v1.2 are enabled on Exchange 2013 CAS servers and SSL v2 is disabled. For example the first of the below graphics comes from a test environment of mine that is running Windows Server 2012 R2 without any of the above registry keys set on them. 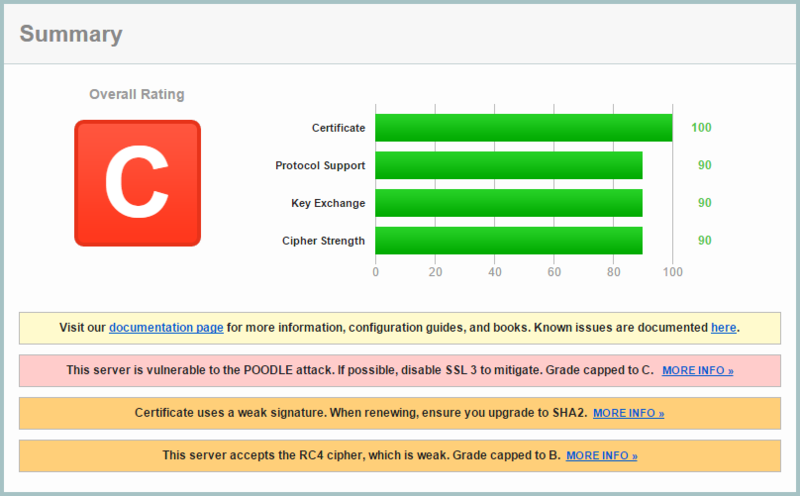 You can see that Windows Server 2012 R2 is vulnerable to the POODLE attack and supports the RC4 cipher which is weak. If you protect your servers with a load balancer, which is common in the Exchange Server world, then you need to set your SSL and cipher settings on the load balancer, unless you are only balancing at TCP layer 4 and doing SSL pass through. Therefore even for clients that have a load balancer, you might not need to make the changes on the load balancer, but on the server via the above section instead. If you do SSL termination on the load balancer (TCP layer 7 load balancing) then I recommend setting the registry keys on the Exchange servers anyway to avoid security issues if you need to connect to the server directly and if you are going to disable SSL v3 in one location (the load balancer) there is no problem in disabling it on the server as well. For a Kemp load balancer you need to be running version 7.1-20b to be able to do the following, and to ensure that the SSL code on the load balancer is not susceptible to issues such as heartbleed as well. To configure your load balancer to disable SSL v3 you need to modify the SSL properties of the virtual server and check the “Support TLS Only” option. To disable the RC4 weak ciphers then there are a few choices, but the easiest I have seen to do is to select “Perfect Forward Secrecy Only” under Selection Filters and then add all the listed filters. Then from this list remove the three RC4 ciphers that are in the list. If you do not select “Support TLS Only” and leave the ciphers at the default level then your load balancer will get an C grade at the test at https://www.ssllabs.com/ssltest because it is vulnerable to the POODLE attack. Setting just the “Support TLS Only” option and leaving the default ciphers in place will result in a B grade, as RC4 is still supported. Removing the RC4 ciphers (by following the instructions above to add the perfect forward secrecy ciphers and remove the RC4 ciphers from this list) as well as allowing only the TLS protocol will result in an A grade. Kemp 7.1-22b does not support SSL v3 for the API and web interface as well as completing the above to protect the virtual services that the load balancer offers. Kemp Technologies document the above steps at https://support.kemptechnologies.com/hc/en-us/articles/201995869, and point out the unobvious setting that if you filter the cipher list with the “TLS 1.x Ciphers Only” setting then it will only show you the TLS 1.2 ciphers and not any TLS 1.1 or TLS 1.0 ciphers. THerefore selecting “TLS 1.x Ciphers Only” rather than filtering using “Perfect Forward Secrecy Only” will result in a reduced client list, which may be an issue. I was able to achieve an A grade on the SSL Labs test site. 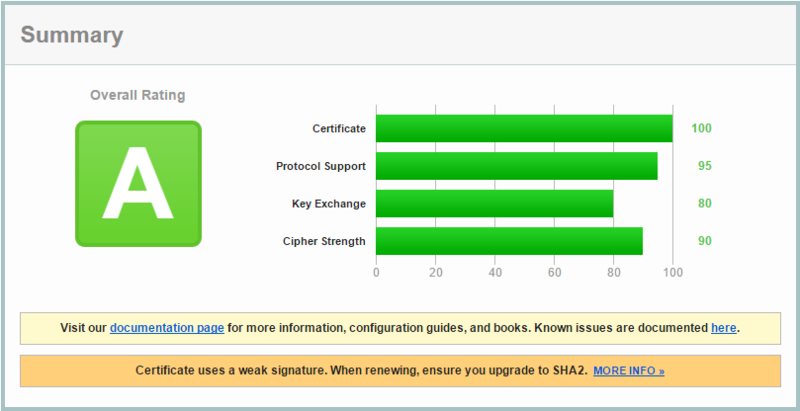 My certificate uses SHA-1, but expires in 2015 so by the time SHA-1 is reported an issue in the browser I will have changed it anyway. For a JetNexus ALB-X load balancer you need to be running build 1553 or later. Build 1553 is a version 3 build, so any version 4 build is of a higher, and therefore valid build. This build (version 3.54.3) or later is needed to ensure Heartbleed mitigation and to allow the following configuration changes to be applied. To configure the JetNexus you need to upload a config file to turn off SSL v3 and RC4 ciphers. The config file is .txt file that is uploaded to the load balancer. In version 4, the primary cluster node can have the file uploaded to it, and the changes are replicated to the second node in the cluster automatically. Before you upload a config file to make the changes required, ensure that you backup the current configuration from Advanced >> Update Software and click the button next to Download Current Configuration to save the configuration locally. Ensure you backup all nodes in a v4 cluster is appropriate. Then select one of the three config file settings below and copy it to a text file and upload it from Advanced >> Update Software and use the Upload New Configuration option to install the file. The upload will reset all connections, do do this at during a quiet period of time. On my test environment I was able to achieve an A- grade with the SSL Test website and the config to disable TLS 1.0, SSL3 and RC4 enabled. 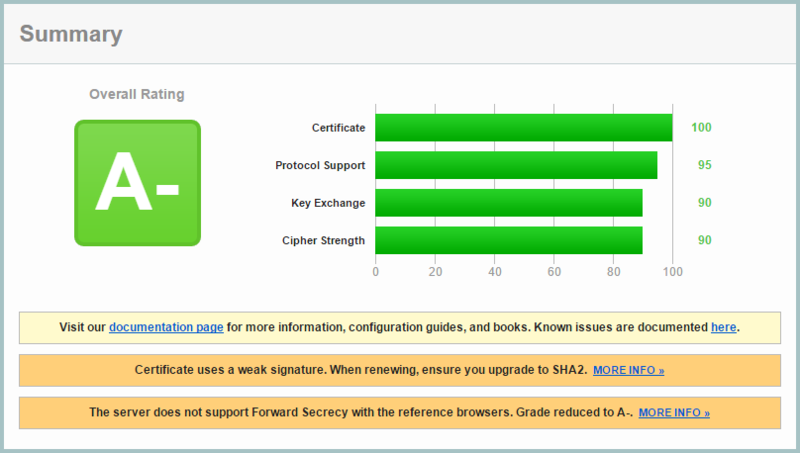 The A- is because of a lack of support for Forward Secrecy with the reference browsers used by the test site. There too much to discuss with regards to clients, apart from they need to support the same ciphers as mentioned above. A good guide to clients can be found at https://www.howsmyssl.com/s/about.html and from there you can test your client as well. Additional comment 23/1/15 : One important comment to make though comes courtesy of Ingo Gegenwarth at https://ingogegenwarth.wordpress.com/2015/01/20/hardening-ssltls-and-outlook-for-mac/. This post discusses the TLS Renegotiation Indication Extension update at RFC 5746. It is possible to use the AllowInsecureRenegoClients registry key at HKEY_LOCAL_MACHINE\System\CurrentControlSet\Control\SecurityProviders\SCHANNEL to ensure that only clients with the update mentioned at http://support.microsoft.com/kb/980436 are allowed to connect. If this is enabled (set to Strict Mode) and the above to disable SSL 2 and 3 is done then Outlook for Mac clients cannot connect to your Exchange Server. If this regkey is deleted or has a non-zero value then connections to SSL 2 and 3 can be made, but only for a renegotiation to TLS. Therefore ensure that you allow Compatibility Mode (which is the default) when you disable SSL 2 and 3, as Outlook for Mac and Outlook for Mac for Office 365 both require SSL support to then be able to start a TLS session. 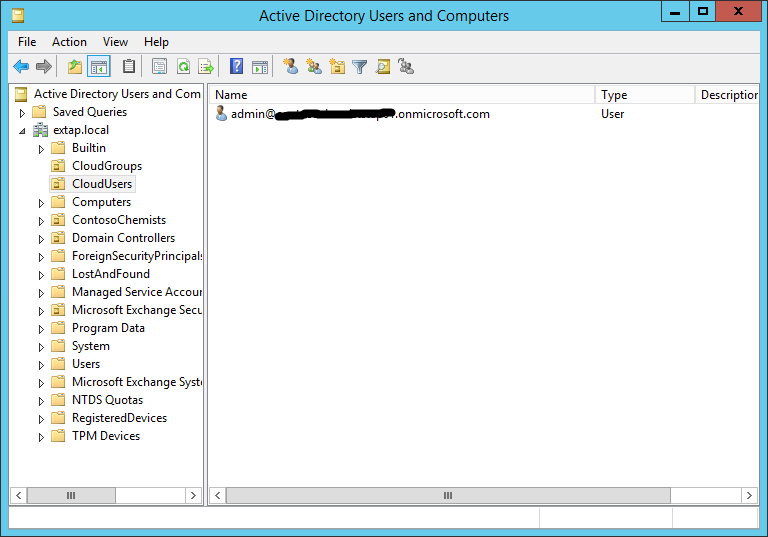 This blog post describes the process to create a new user in Active Directory on-premises when email is held in Office 365 and DirSync is in use. With DirSync in use the editable copy of the user object is on-premises and most attributes cannot be modified in the cloud. 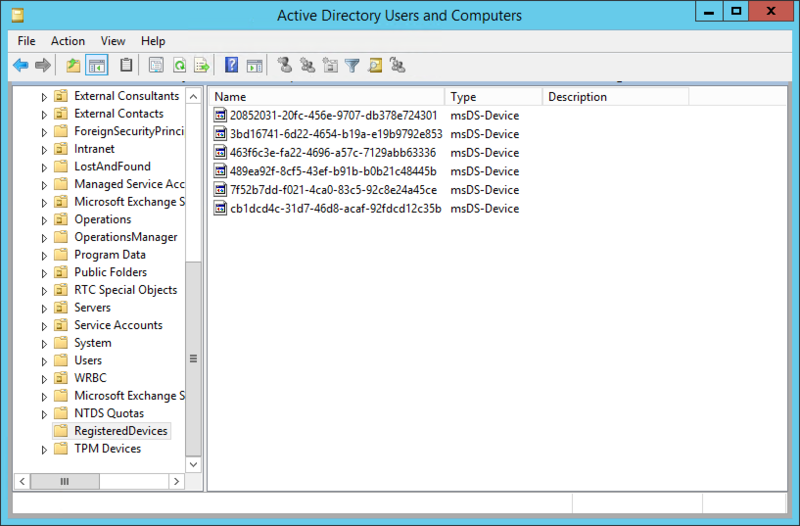 Note that if you do not have 2008 R2 or later then use ADSI Edit to make the changes mentioned below that are made on the Attribute Editor tab in Active Directory Users and Computers 2008 R2 or later. 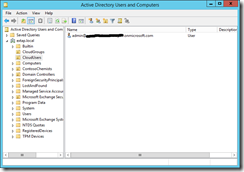 Create an Active Directory user as you normally would. 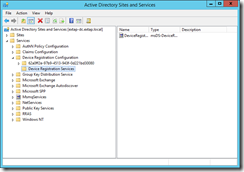 Do not complete any Exchange server properties if you are requested to do so. Completing Exchange on-premises will make a mailbox on premises that will then need to be migrated to Exchange Online. This document describes creating the mailbox online. Ensure that the user’s email address on the General tab of the AD properties is correct. proxyAddresses: SMTP:primary.email@domain for this user – SMTP needs to be in capitals. Then add additional email addresses as required, but these start with smtp: in lower case. 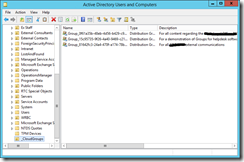 Note that both these addresses need to be unique within your directory – Attribute Editor will not check them for uniqueness but they will fail to replicate to Azure with DirSync if they are not unique. Click OK and close the account creation dialog. 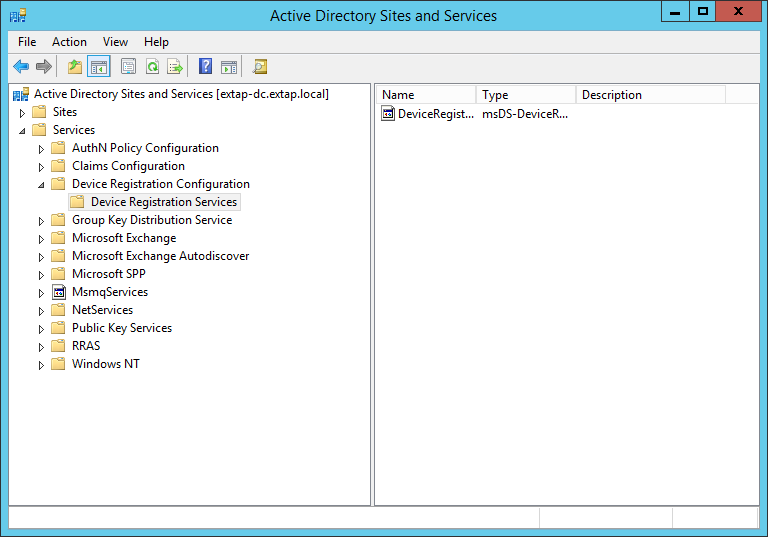 Within three hours this object will sync to Windows Azure Active Directory. Type “Start-OnlineCoexistenceSync” in PowerShell – DirSync will replicate now rather than waiting up to three hours. Check that the DirSync process was successful – if you have entered values that are not unique then DirSync will fail to replicate them and you will need to fix them on-premises and replicate them again. Licence the user in Office 365 by logging into https://portal.office.com and granting a licence to this user that contains an Exchange Online licence. The mailbox will be created automatically shortly after this. The above attributes are not the full and exclusive list of attributes and values that you need to set. For example, in Jan 2018 Microsoft published support for delegate access permissions across forest in a hybrid deployment – this uses values that are mentioned in the full list link in the paragraph above but are not set here. This document should only be used as a reference and not to create or maintain mailboxes for AD accounts that are synced to the cloud – for that you need to have an Exchange Server as that is the only supported way to maintain your Exchange Online attributes. At Microsoft Ignite in 2017, it was announced that cloud management for synced accounts is coming – until that time you are best advised to have the Exchange Server for its admin tools only installed on-premises as well. 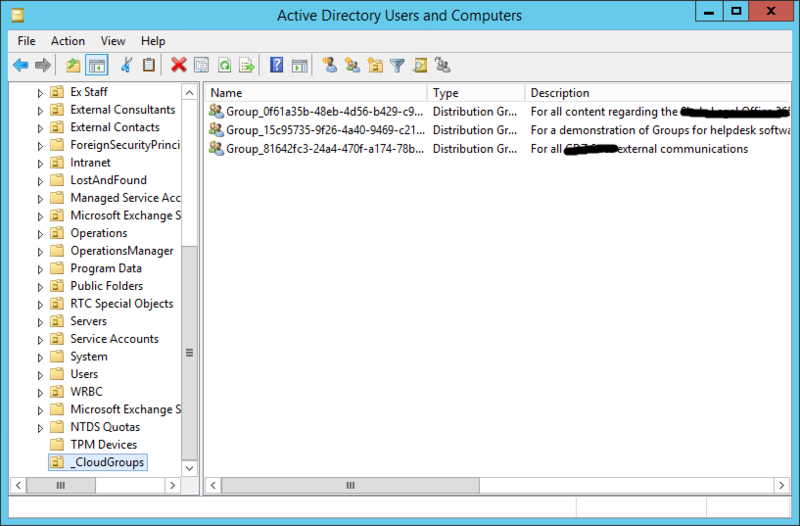 Exchange 2013 has a feature called Managed Availability. This feature detects issues with a server and in the event of an issue attempts to fix the component at issue. Fixes range from simple restarts of the component (for example restarting the service) to doing what is called a bugcheck. A bugcheck is forcing the server to “blue screen” and therefore reboot. Bugchecks occur when earlier simple fixes do not work. 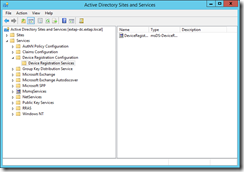 For example if the service cannot be restarted then service is moved to another node in the DAG or the Exchange 2013 aware load-balancer takes the CAS server out of service. If Managed Availability still cannot fix the server it is bugchecked. There is one or two obvious issues with this though – the first is when you are upgrading or patching the server and the second is in a lab environment. In both these scenarios you could have servers that are considered not responsive to Managed Availability when its only because a patch or Exchange cumulative update (CU, previously known as Rollup Updates), is being installed. This blog will discuss how to tell Managed Availability not to cause things such as reboots to happen during updates or in low spec’ed lab environments. When the patch process starts on Windows or a Cumulative Update for Exchange is installed services are stopped and possibly disabled. Disk I/O might be higher and your underlying disk subsystem might not cope well (though this is more likely to be an issue in a lab environment). The last thing you want is services being restarted, services therefore failing, and therefore Managed Availability considering that the server is dead and needs a reboot – and so in the middle of an update it blue screens. For mailbox or multi-role servers step 1 should be done independent of other steps. Step 1 places the transport queues into “draining” mode, which means the server processes existing queues but does not accept new connections. Once the queue has drained, which can be checked with Get-Queue, then do steps 3 to 9. (Added 5th Feb 2013**): To speed up draining of the queues it is possible in Exchange 2013 to move the messages to another server using Redirect-Message. The Target in RedirectMessage must be an FQDN and if the Server (i.e. where the queue is sourced) is missing then the local server is used. Only active queues are moved with this command, poison and shadow queues are not moved (End of Update**). Steps 3 to 6 place the DAG node offline and move mailbox databases onto other nodes in the DAG. Steps 7 to 9 confirm these changes with a report to the screen. Note these cmdlets all use $env:COMPUTERNAME so they run on the local machine that you want to place into Maintenance Mode. You can replace $env:COMPUTERNAME with the actual server you want to effect if you want to run the cmdlets remotely. CAS only servers only have one step, and that is the same as step 6 in the mailbox/multi-role server process. Once mailbox or multi-role server steps are complete you need to move databases that you want back to this server, or start maintenance on another server (as that might move databases to this server for you). Finally note that going into maintenance mode is not an immediate step. It takes somewhere between 5 and 10 minutes (in my tests) for the Health Service to pick up these changes and implement them. Also note that where you only have one server or one DAG node available, the Health Service will not action maintenance mode as it will reduce availability to a point where service fails – for example if you only have one CAS server then the above command will not stop connections to OWA of Frontend Transport through that one CAS server. The above will tell Managed Availability not to do any recovery actions in the event of an issue. Therefore if your lab is (for example) slow because you are overworking the disks, then your Exchange Servers don’t blue screen and add to the load on the disk. If you see your lab environment is regularly reporting that the server recovered from an unexpected failure then see if the following bugcheck codes are in the Event Viewer. I’ve seen these as being caused due to attempts to force a bugcheck and reboot some of my lab machines whilst I was installing Exchange on other servers on the same disk. Earlier this week at the Microsoft Exchange Conference (MEC 2012) I led a session titled Configuring Rights Management Server for Office 365 and Exchange On-Premises [E14.314]. This blog shows three videos covering installation, configuration and integration of RMS with Exchange 2010 and Office 365. For Exchange 2013, the steps are mostly identical. This video looks at the steps to install AD RMS. 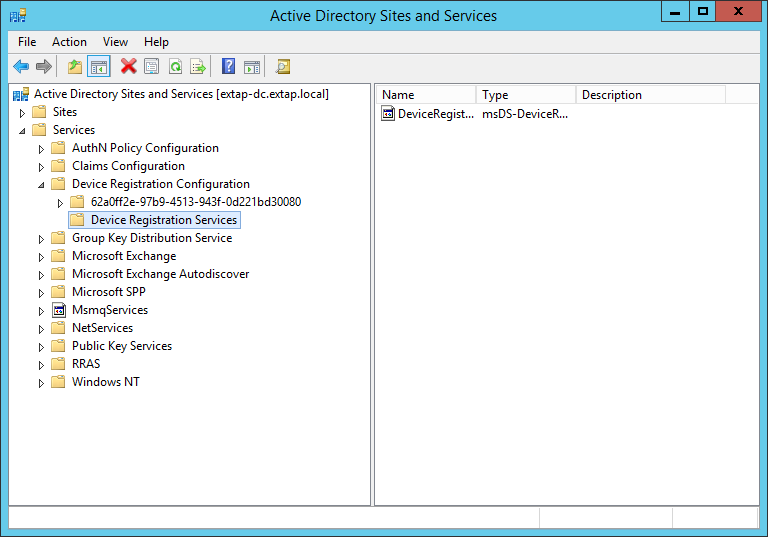 For the purposes of the demonstration, this is a single server lab deployment running Windows Server 2008 R2, Exchange Server 2010 (Mailbox, CAS and Hub roles) and is the domain controller for the domain. As it is a domain controller, a few of the install steps are slightly different (those that are to do with user accounts) and these changes are pointed out in the video, as the recommendation is to install AD RMS on its own server or set of servers behind a IP load balancer. The second video looks at the configuration of AD RMS for use in Exchange. For the purposes of the demonstration, this is a single server lab deployment running Windows Server 2008 R2, Exchange Server 2010 (Mailbox, CAS and Hub roles) and is the domain controller for the domain. This video looks at the default ‘Do Not Forward’ restriction as well as creating new templates for use in Exchange Server (OWA and Transport Rules) and then publishing these templates so they can be used in Outlook and other Microsoft Office products. The third video looks at the steps needed to ensure that your Office 365 mailboxes can use the RMS server on premises. The steps include exporting and importing the Trusted Publishing Domain (the TPD) and then marking the templates as distributed (i.e. available for use). The video finishes with a demo of the templates in action. If before you use Sysprep to prepare a Windows machine for imaging you set the administrators password “User cannot change password” then sysprep will not clear this setting, but will set the “User must change password at next logon” setting. Normally these two settings are mutually exclusive, but in the scenario for sysprep it seems they can both end up being set. This means you get prompted to reset you password at first logon after sysprep completes and then find you have “Access Denied” as the response. There is seemingly no way around this Catch-22. That is unless you use the Offline NT Password and Registry Editor. This tool allows password resets when booting the server from a CD or USB key (so physical access to the server is required). As the download for this is an iso file, it can also be used in virtual environments by configuring your virtual machine to boot from the iso you have downloaded. For Vista and earlier select the default of Option 1. For Windows 7 and Windows 2008 and later select Option 2 (to boot into the second partition on the disk). You might need to select a different option if you have more partitions. You need to select the partition that Windows is installed on. Once you see “Unlocked!” you can quit from this program. The process to quit requires you to save your changes. Note that the default setting is not to save changes, so you cannot now use Enter to select the default option. At this final screen you can remove the CD or unmount the iso image from your virtual machine and press CTRL+ALT+DEL to restart the server. The server should now boot into Windows and auto-logon as it has a blank password. Change the password and optionally untick the “User cannot change password” setting. This set of instructions goes through the process for installing Dell Open Manager on Windows Server 2008 R2 and Windows Server 2012. You need to install 6.5 first, or you will get errors about “omchecks has stopped working” failing during the RunPreReqChecks process and an error about “Failed to load OMIL Library” when running the actual installer. If you cannot find version 6.5 for your server, then download a copy of 6.5 for any other Dell server model such as found here http://www.dell.com/support/drivers/us/en/uscorp1/DriverDetails/DriverFileFormats?DriverId=G2WT6&c=us&l=en&cs=&s=corp or by searching via a search engine. After downloading 6.5 expand the zip to c:\OpenManage65 and if needed copy to the server you are installing on, or burn a DVD and insert it into the server in question. Fix any errors listed. You should get a 2 as the Return Code. You might need to view the prereqchecker HTML file that it creates. This is made in your temp directory. Cd %TEMP% to see what this is. It will be something like c:\Users\username\AppData\Local\Temp\2. To open the HTML output file connect to this temp folder from a machine with IE installed on it and open omprereq.htm. Fix any listed errors. Choose Custom and add the Remote Enablement option. Install Open Manage 7.1. The steps here are similar, just from the directory containing version 7.1 instead. Choose Custom and add the Remote Enablement option (though as this is now an upgrade it should already be selected). Finish by browsing to https://remoteserver:1311 not forgetting the s in https. You will get a certificate error and once connected you can replace this if you wish or are required to by corporate policies. To do a backup of the virtual machines installed on your Hyper-V Server (2008 or 2008 R2 editions) you need to complete the following steps. Install the backup feature by typing start /w ocsetup WindowsServerBackup from the command prompt. 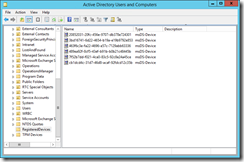 Get a list of the drives on which Hyper-V Server has stored virtual machines. This will be C: unless you have made changes. Determine the times you want to run the backup at. The disk drive letter will be displayed for the disk that matches the size of your removable disk. Type exit to exit diskpart. From the command prompt type wbadmin enable backup -addtarget:x: -schedule:hh:mm,h2:m2 -include:y:,z: -systemState -allCritical to backup to drive X: the contents of drives Y: and Z:, the system state and all drives critical to the running of the server. Confirm you want to schedule the backup at times HH:MM and H2:M2 (for twice a day). If you want one backup a day use HH:MM and if you want more than two just comma separate a group of times. Enter times as per local timezone. Check the current time on the Hyper-V Server by typing time from the command prompt. Start a backup now if you want by typing wbadmin start backup and confirming to use the same settings as the scheduled backup. Backup will proceed in the console. If you log out backup will remain running. Enter wbadmin enable backup to see the settings you have enabled. Type wbadmin get versions to see what backups have completed. The reason! It was because I had entered an incorrect routing record in the text file. So to get this right, add the routes manually when connected and make sure they work, and then duplicate these entries in the text file. If the routes cannot be added on the command line then the VPN connection will fail with the above error message. At a client site, I needed to enable within a web cluster the ASP.NET session state service (ASP.NET State Service) and initially this was going to go on one server within the web cluster. The only problem though, as this configuration is easy, was what happens if the one server in the cluster that this is running on is the server that fails! The solution we decided was to place the service on the SQL Server back-end database. Though this is not clustered (as it is not mission critical), if the database is unavailable then so is the application so why not run the ASP.NET State Service on that machine. We went to the SQL Server (which was running Windows Server 2003 and so had the .NET Framework installed), but found that the service did not exist as ASP.NET was not installed. Set “HKEY_LOCAL_MACHINE\SYSTEM \ CurrentControlSet \ Services \ aspnet_state \ Parameters \ AllowRemoteConnection” to 1 on the server in the above step, set the service to Automatic and started it running. And it all worked fine.